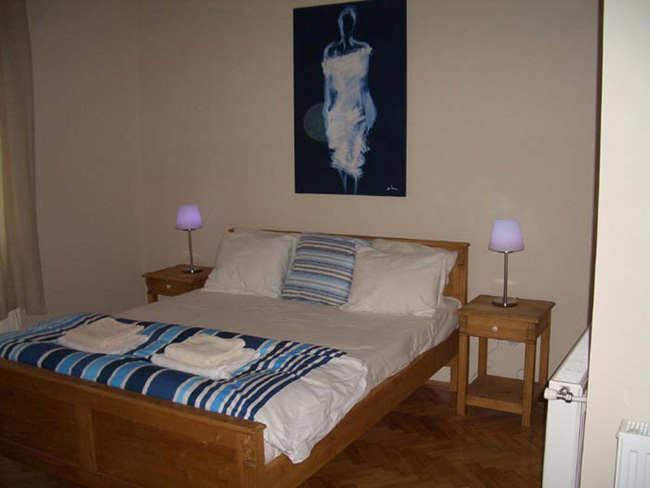 We are delighted to offer this newly renovated studio apartment on the second floor overlooking a courtyard in a traditional city building, located within walking distance of the major attractions of Budapest, offering quality, style and comfort. 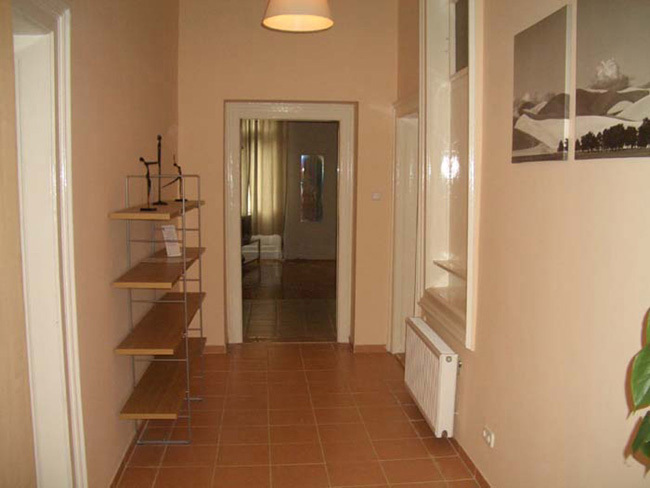 The apartment is located in the heart of the historic inner VIII district on Miksz�th K�lm�n t�r. 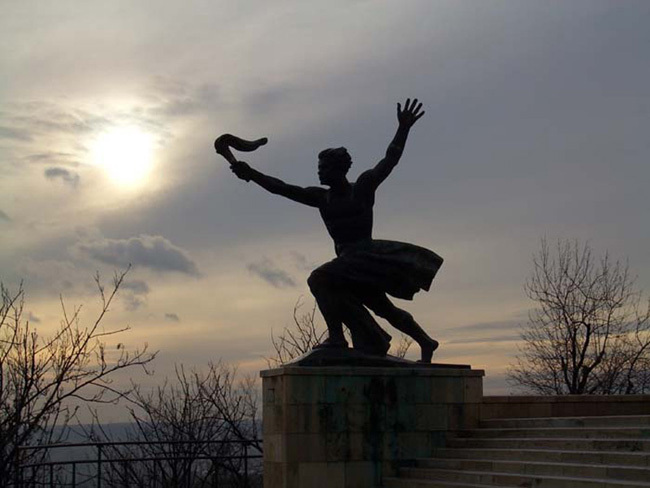 A stroll down Kr�dy Gyula U. to the Small Boulevard leads to the fascinating National Museum, the magnificent Synagogue with the Jewish museum and Tree of life memorial a short walk away on Dohany Utca. 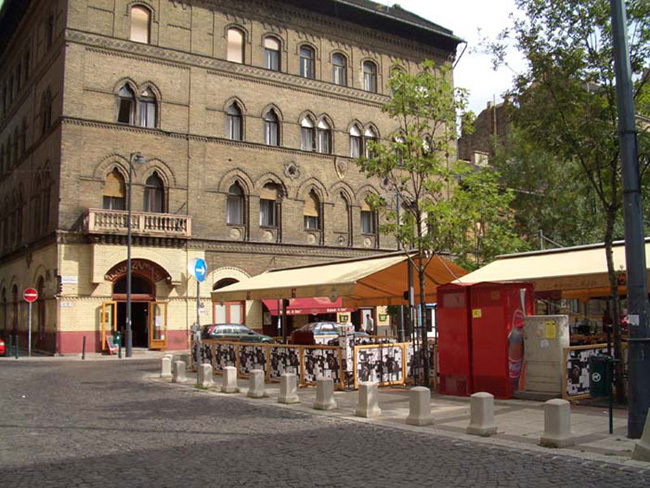 Cross the Small Boulevard and walk towards the Danube and you will come across Vaci Utca one of the main shopping areas of Budapest. 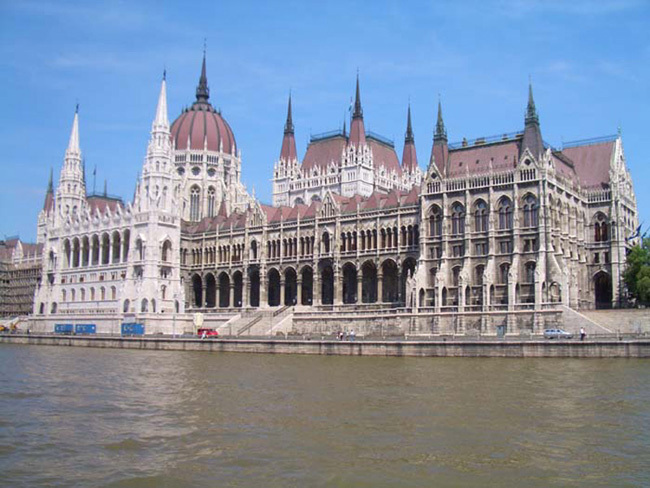 Wander along Vaci Utca and make your way to the Danube and you will see the magnificent Castle district on the hill overlooking Pest and the stunning Parliament building. There are numerous bars and restaurants close by. For a relaxing coffee or beer in the evening sunshine Mikszath Kalman Ter (Square) is a great place to chill out, Raday Utca which has many vibrant pavement caf�s, interesting boutiques and restaurants is a short walk away or take a Tram from the Grand Boulevard (Jozsef Korut) to the Octogon for the delights of Liszt Ferenc Ter. The world famous New York Coffee House, recently restored in golden splendour, is a must on the Grand Boulevard towards the Octogon. 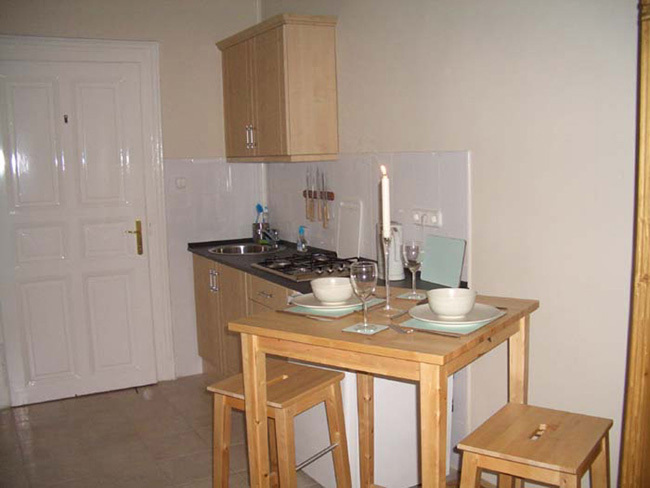 This is a bright and airy studio apartment, carefully designed and fully renovated. 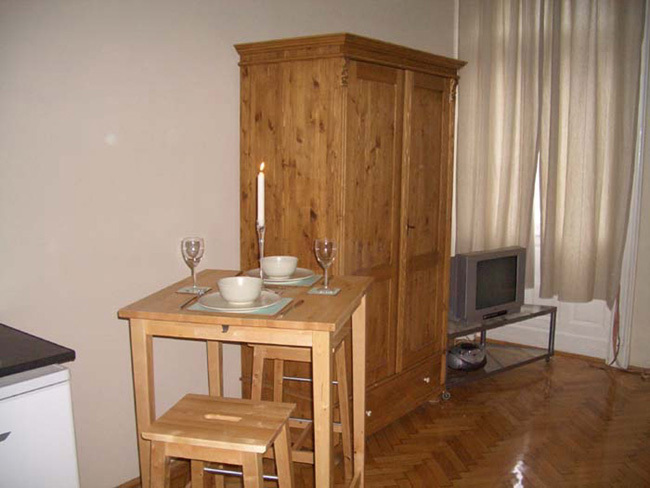 This really great studio is an absolute must for visitors looking for a relaxing atmosphere in a central location. The apartment is all one space but has been given the feeling of two separate areas, a living area with kitchen diner and a sleeping area. The look is modern, fresh and elegant. The apartment comprises an open plan studio with good quality kitchen and bathroom; living area, coffee table and TV with cable channels. 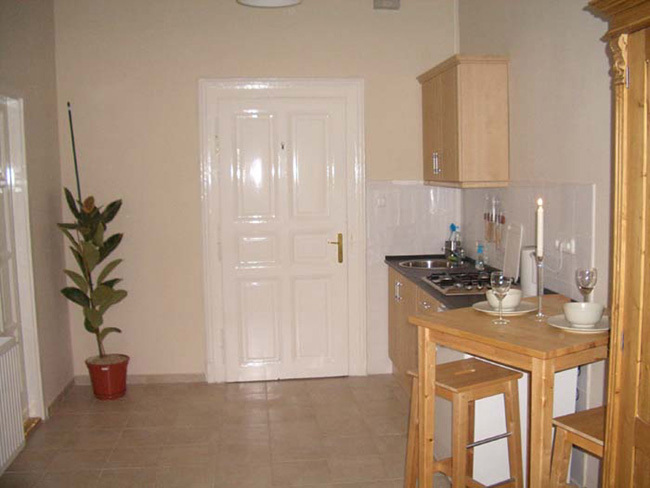 The kitchen is fully equipped with ceramic gas hob and oven. The apartment is fully serviced with an ample supply of quality towels and bedding. The number 4 Tram can be found on Josef Korut (the section of the Grand Boulevard at the top of Krudy Gyula Utca) and from there you can travel either to the Danube and connect with the number 2 Tram which takes you on the most picturesque Tram route in the city along the banks of the Danube or go in the opposite direction to the Octogon which connects with the world heritage site; Andrassy Utca with the Opera House, Terror Museum, Hero Square at the top and the main West end shopping centre a short walk or a couple of Tram stops further on. 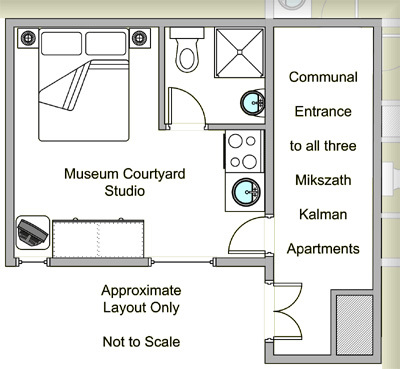 The Metro system can be accessed from Kalvin Ter, a short walk away.